Info "He'd be happier with some fruit." Harvest Time is one of Ashley's microgames in WarioWare: D.I.Y. The point of the game is to drop the three apples into the harvester's basket. The game starts off with the harvester moving slowly eastward. On top of the tree are three apples, two yellow and one red, each placed in random locations. The player must have good timing for this microgame. 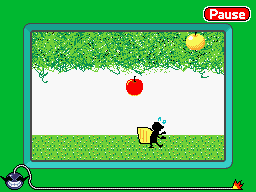 It is recommended that the player drops the apple right before the harvester is aligned with it. The player must tap the apple to drop it. If the harvester collects all three apples, the game is won. However, if one of the apples fall and splatters on the ground, the game is lost. This page was last edited on July 18, 2018, at 10:53.